Henry Ramon Blanco was born on August 29th, 1971 in Caracas, Venezuela. The five foot eleven catcher got drafted as an amateur free agent in 1989 by the Los Angeles, Dodgers. The catcher spent seven years toiling in the minors before making to the Dodgers big league squad in 1997. His best asset was always his good arm & his defensive abilities behind the plate. 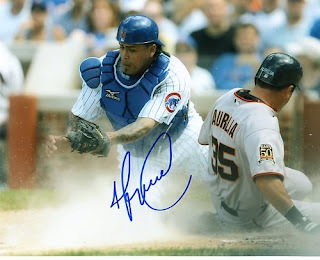 He made a career at being at being a solid backup catcher in Los Angeles (1997) then with the Colorado Rockies (1999) Milwaukee Brewers (2000-2001) Atlanta Braves (2002-2003) Minnesota Twins (2004) Chicago Cubs (2005-2008) San Diego Padres (2009) the New York Mets (2010) & Arizona D-backs (2011-2012) Toronto Blue Jays (2013) Seattle Mariners (2013). Defensively, he has a strong arm and has excelled in throwing out base runners. In 1999 he led all catchers throwing out 39 runners, and would throw out over 30 runners twice more coming in second place in the league's top ten both times. In those seasons he led in caught stealing percentage, and has thrown out over 40% of would be base stealers seven times in his career. He is second best at that percentage (43%) among all active catchers. His .994 fielding percentage is 16th best all time behind the plate. In his career he has only made 37 errors in 892 games & over 6938 innings played. Besides his defense he will always be remembered for his tattooed arms, not the most common site among baseball players until recently. In 2004 he was the Twins main catcher in the year Johan Santana won his first Cy Young Award. Blanco played in 114 games hitting 10 HRs with 19 doubles & 37 RBIs. Behind the plate he caught 49% of runners trying to steal (best in the AL), thirty runners in all (second in the league). The Twins won the A.L. Western title that year. In Game #4 of the NLDS he hit a HR off Javier Vazquez in the 6-5 loss. The next season a he signed a four year deal with the Chicago Cubs and played as back up, first to Michael Barrett & then Geovany Soto. There he became a popular player and earned the nickname of "Hank White". In the 2008 Chicago Cubs NL Central Division winning season, Blanco hit for his personal career best .292 with a .325 on base % in 58 games. 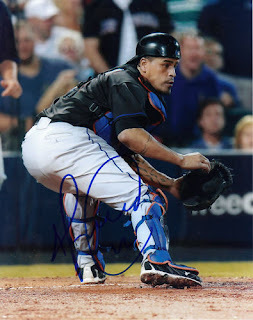 After four years with the Cubs, Blanco signed on with the New York Mets in 2010 to share catching responsibilities with Rod Barrajas. In his first Mets game on April 10th, he got the start behind the plate catching Oliver Perez. Perez would allow four quick runs & be gone. In the 4-3 loss to the Washington Nationals, Blanco drove in a run on a sac fly and had two hits. On May 8th, he hit his first Mets HR & it was an exciting one. It was a walk off game winner at Citi Field against the San Francisco Giants. That night he had a big three hit game and would close out the month with another three hit game against the Brewers in Milwaukee. 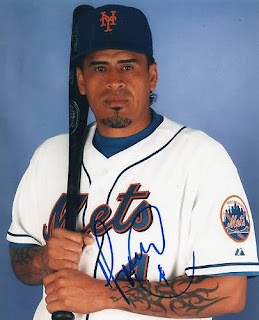 On June 10th he hit another HR at big Citi Field, a two run shot against the San Diego Padres. Rod Barajas was hitting a lot of HRs early on & seeing the majority of the playing time in New York, until he was traded late in the season. Then young catcher Josh Thole began to get into games with Blanco seeing less time. Overall Behind the plate, in 46 games Blanco threw out 11 of 22 base runners attempting to steal (50%). He was let go to free agency after the season & signed on with the Arizona D-backs at the age of 39. He played two seasons there as a back up to Miguel Montero, making the post season in 2011 going 0-1. In 2013 he was signed by the Toronto Blue Jays appearing in just 15 games before getting released. He was picked up by the Seattle Mariners and hit a grand slam HR on June 15th, his first game in a Mariners uniform. It came during a 4-0 "King" Felix Hernandez shutout of the Oakland Athletics. At age 41 he was one of the oldest players in the league & retired at the end of the season. In a long 16 year career he is a .223 hitter with 72 HRs 145 doubles 11 triples 298 RBIs & a .288 on base %. Behind the plate he has caught 914 games throwing out 43% of would be base stealers. He has also helped turn 78 double plays (97th all time) & made 5659 put outs (84th all time). Drama: In 2008 his brother Carlos was kidnapped in Venezuela, and the criminal’s asked for 200 million Venezuelan bolívares. Henry attempted to negotiate but his brother was sadly found dead shortly after.